1. I have ALWAYS wanted a pool. I may have mentioned I use to be a competitive swimmer. Not near the level of Michael Phelps but I was good. I loved it. I thought better while swimming laps. Anyway... there has always been a reason why I couldn't have one. Usually it was, whoever I was with didn't think we should have one. I may not be living here forever, Greg doesn't want a hole dug in his yard, or all the effort involved in packing sand for a large above ground. But I did talk him into the largest easy set pool. He even sat it up for me. The only drawback is we thought the ground was more level than it was and its leaning to the left some. 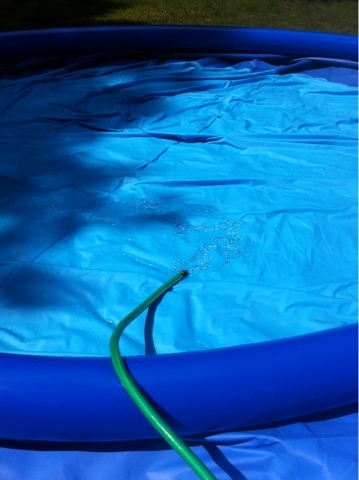 Not enough that I'd try draining the pool. 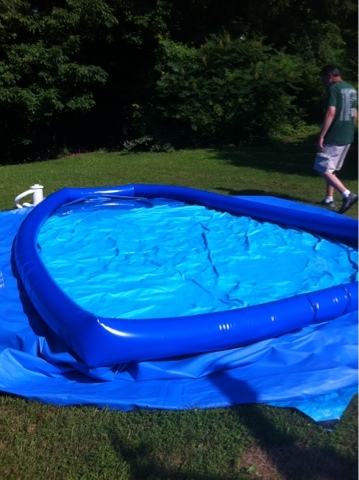 I said Its enough water for me to get wet and teach the girls to swim in. I may even be able to swim a stroke or two before I hit the wall. Woke up this morning to this.. Collapsed pool! Guess I will have to level it better before I refill it. 3. 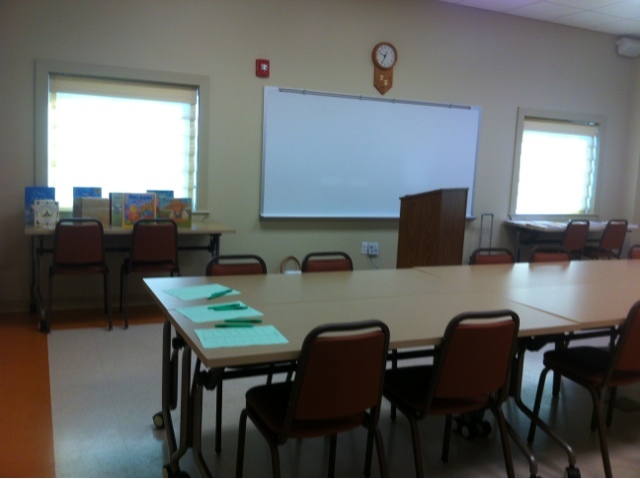 I had my first training as an Early care and education trainer. No one got up and left or booed me so I guess I did alright and people will allow me to train them again. 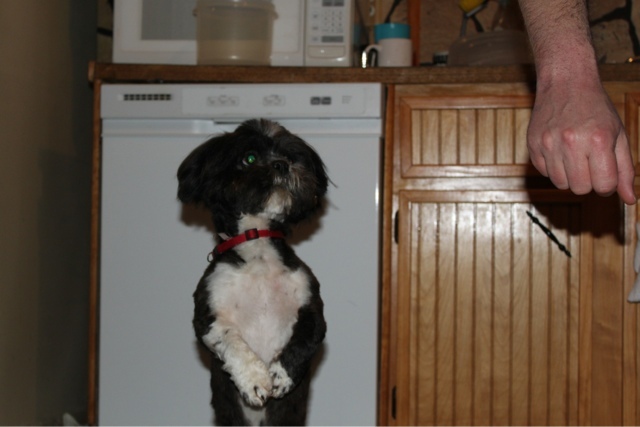 The topic was early literacy which you may have heard is a pet cause of mine. I also gave everyone a multi faceted lesson plan based around the book the runaway bunny and I gave then A bunny, home and journal to share with their class. I have done this with a class if mine way back when I was teaching and everyone loved it. The kids take bunny home and return on Monday to share their adventure with the class. 4. 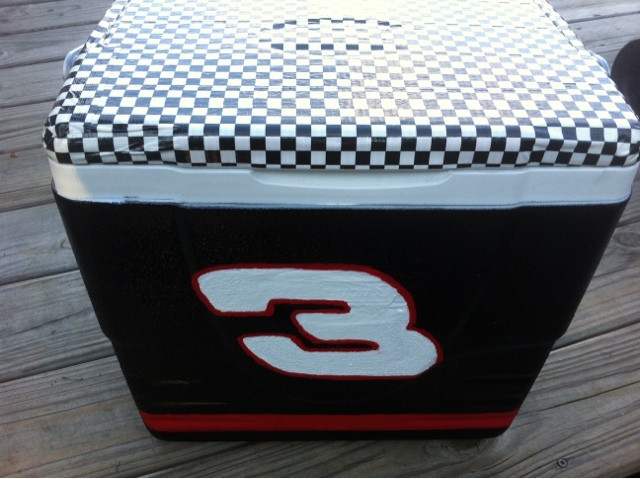 I finished the dale Earnhardt painted cooler. A tutorial will come next week. Lets just say this cooler had some challenges. 5. My sister brought her dog Inigo over to play with Westley. They hadn't seen each other in months and had fun. I love watching the doggie cousins play. See he is so excited he's trying to dance. Hope you have a great weekend. This post was completed entirely on my phone so if it looks jacked up that's why. My parents have the biggest, longest backyard I've ever seen. Like, it's bigger than their actual house. And no matter how much I suggest it, they refuse to get a pool. It's such a shame. Enjoy the pool! Sounds refreshing on a hot day.